This article describes the formula syntax and usage of the PRICE function in Microsoft Excel. Returns the price per $100 face value of a security that pays periodic interest. If settlement or maturity is not a valid date, PRICE returns the #VALUE! error value. 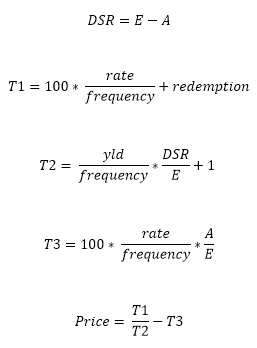 If yld < 0 or if rate < 0, PRICE returns the #NUM! error value. If redemption ≤ 0, PRICE returns the #NUM! error value. If frequency is any number other than 1, 2, or 4, PRICE returns the #NUM! error value. If basis < 0 or if basis > 4, PRICE returns the #NUM! error value. If settlement ≥ maturity, PRICE returns the #NUM! error value. DSC = number of days from settlement to next coupon date. The bond price, for the bond with the arguments specified in cells A2:A8.